There has been widespread news media coverage of the conference, focusing on Prof. Stephen Norwood’s address, in which he documented how the president of Harvard University forged friendly relations with senior Nazi officials and Nazi-controlled universities in the 1930s, urged a major corporation not to hire a German Jewish refugee scientist, and made antisemitic comments in his private correspondence. Prof. Norwood’s remarks, and the panel discussion which followed, launched the first serious public discussion about the American academic community’s response to Nazism. There were two lengthy articles about Norwood’s remarks in the Boston Globe, as well as articles in numerous other newspapers, including the Chicago Tribune, Chronicle of Higher Education, Miami Herald, Dallas Morning News, Washington Times, Baltimore Sun, and Toronto Globe and Mail. Articles have also appeared in newspapers in Israel, Turkey, and India. In addition, Prof. Norwood has been interviewed on numerous radio stations, including a half-hour interview on WABC Radio in New York City. Saadia Gelb, one of the elder statesmen of the Zionist movement, is a veteran leader of Labor Zionism and the kibbutz movement. During the 1930s, Gelb was one of the founders of the Labor Zionist youth movement Habonim and a U.S. representative of the Histadrut labor union. In the 1940s, he recruited volunteers and smuggled equipment to the Haganah, the main underground militia in British Mandatory Palestine. He was also an editor of the journal Furrows, which strongly criticized the Roosevelt administration’s failure to rescue Jews from the Holocaust. After the war, Gelb moved to Israel, became a leader of Kibbutz Kfar Blum and the national kibbutz movement, and also served as the first Labor Party emissary to the United States. In his recently published autobiography, The Chase is the Game, Gelb described his unsuccessful attempt, in 1943, to persuade Rabbi Dr. Stephen S. Wise that President Roosevelt was misleading the Jewish leadership with his claim that the U.S. was doing all it could to aid European Jewish refugees. To commemorate the 66th anniversary of the Kristallnacht pogrom in Germany, the Wyman Institute sponsored a program at the Hebrew Academy, a prominent Jewish day school in Rockville, Maryland on November 9, 2004. It included a display of “Cartoonists Against the Holocaust: Art in the Service of Humanity,”our exhibit of 1940s editorial cartoons that challenged America’s response to news of the Holocaust. Wyman Institute director Dr. Rafael Medoff addressed some four hundred middle-school and high-school students about Kristallnacht, the U.S. response to the Holocaust, and the cartoonists who used their art to raise public awareness of what was happening to the Jews in Europe. The event received substantial attention in the local media. On the eve of the Holocaust, Yitshaq Ben-Ami and Rabbi Louis I. Newman were leaders of a small group of activists who waged a lonely struggle in America in support of the campaign to smuggle Jews from Europe to Palestine. Now their live-saving efforts will receive public recognition at a special Wyman Institute dinner in New York City. The dinner will take place on Thursday, January 13, 2005, with a reception at 6:00 pm and dinner at 7:00 pm. Appropriately, it will be held at Temple Rodeph Shalom, 7 West 83 Street, New York City, where Rabbi Newman was spiritual leader for more than forty years, and Ben-Ami was an active congregant for more than twenty years. 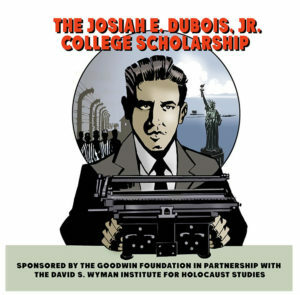 All proceeds from the dinner will go to benefit the Wyman Institute’s educational programs focusing on Americans who sought to promote the rescue of Jews from the Holocaust. Please join the Ben-Ami and Newman families for this very special evening of tribute to those who had the courage to speak out. Tickets may be purchased through our web site, www.WymanInstitute.org. The new book, “The Dispossessed: An Anatomy of Exile,” by Wyman Institute Academic Council member Prof. Peter Rose (Smith College) has just been published by the University of Massachusetts Press. The volume has a foreword by Liv Ullmann (whose grandfather was captured hiding Jews in Norway and died with them in Dachau) and a series of contributions by those who took part in the yearlong colloquium Rose organized on “The Anatomy of Exile” at the Kahn Liberal Arts Institute at Smith several years ago. The underlying themes of the colloquium and of two symposia (in which David Wyman took part) held in conjunction with it were flight and the dependency of the dispossessed. Prof. David Weinberg (Wayne State U. ), a member of the Wyman Institute’s Academic Council, will speak at a conference on Dutch Jewry, which is being held from November 22-25 at Hebrew University, in Jerusalem. He will present a paper on relations between the American Jewish Joint Distribution Committee and the Dutch Jewish community in the immediate postwar period. In January, Prof. Weinberg will be chairing and commenting on a panel on Reconstructing Jewish Communities, at a conference on Reconceptualizing Jewishness in Postwar Europe, to be held at the University of Antwerp in Belgium. Thane Rosenbaum, a member of the Wyman Institute’s Arts & Letters Council, authored an op-ed in the New York Sun on November 9, titled “The Banality of Kitsch.” Writing on the 66th anniversary of Kristallnacht, he commented on several disturbing recent events, including the release of a new German film portraying Hitler as “tender, and even sympathetic,” and the opening of a souvenir stand on the grounds of the Buchenwald death camp.